We've actually got daffodils coming up. 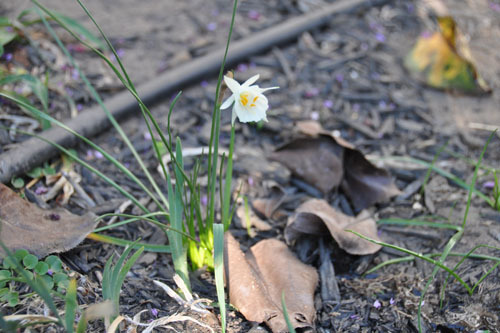 Some of the larger daffodils are sending up shoots out front, and the early miniature daffodils are blooming in back. I just hope nobody gets killed by the winter weather when it shows up. For those unfamiliar with San Francisco weather, we get our warm sunny days in spring and autumn, with only a few really hot days in the summer, but a lot of summertime fog. Over across the bay in Alameda we get a bit more sunshine but it still chills down quickly after 4pm when the fog rolls in off the Pacific. After our brief warm patch in September/October, it dips down into the 50's with rain and overcast skies for most of the winter. So there's plenty of opportunity for some plants to get confused in the autumn if they are temperature-driven. 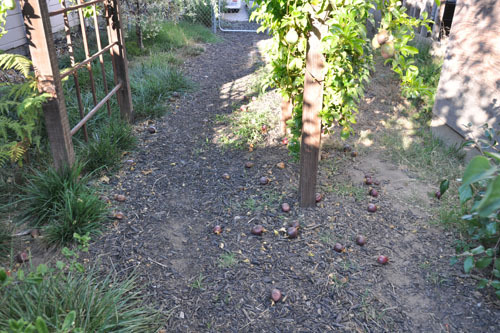 At least the fruit trees seem to mostly be in tune with what should be happening. 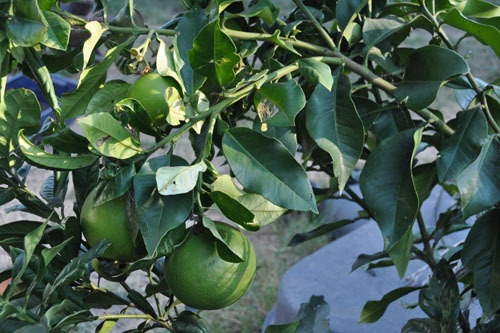 This is our pomelo tree, which is doing what pomelos do and bending over under the weight of its fruit. I'm pretty excited about getting some fruit from this tree this year. True, we get a couple pomelos every winter in our vegetable box, but it's different to grow it yourself. Speaking of which, I think the passionfruit vine has crossed some kind of rubicon or something, because it has been dumping fruit on us for a month or so, with no signs of stopping any time soon (there's still plenty of fruit on the vine). Extra-large batch of passionfruit jelly, ahoy! Still one of our most popular put-ups, at least with our friends who grew up in places where passionfruit grows more freely. And the crabapple tree decided to fruit this year, too. It might have done last year had I just planted it in the ground when I first got it, but I tried growing it in a pot which meant it was chronically underwatered. It seems very happy out front and I look forward to the first dummy who steals a crabapple for eating. This is a 'Whitney,' which was a hand-me-down tree from a friend who was moving to Seattle (where she now has a massive garden with room for a really large orchard). I kind of prefer Dolgo, but I haven't really given Whitney a chance, so I'm going to see how it goes. The fruit looks really nice. Things are a little slow in the garden right now, in part because the gardeners came through and did a massive pruning in the front. But the salvias are still going along nicely. 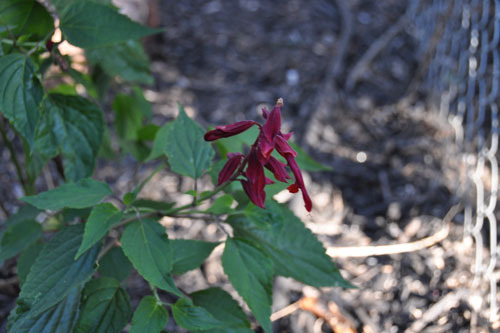 This is Salvia vanhouttei, planted right by the back gate. When the flowers are on the top of the plant, the hummingbirds love it. These lower ones seem to be neglected. 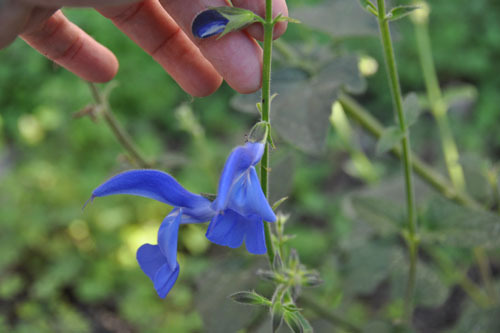 The Salvia patens 'Guanajuato' still has some flowers. It hasn't really grown into them yet. I'm sparing you a photo of a scrawny small shrub and giving you the money shot of the enormous flowers plus my hand. Maybe in a couple years it will be reasonably sized. Actually, I can't wait. 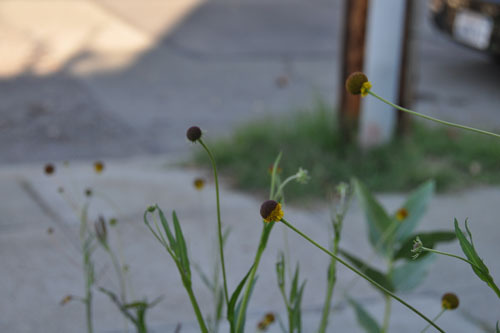 This is the Helenium puberulum. It's supposed to be very popular with butterflies, but I've never seen one on it. I have it out front under the crabapple where I keep forgetting about it; it's a little subtle. I'm thinking of moving it into a pot where it will be more noticeable. 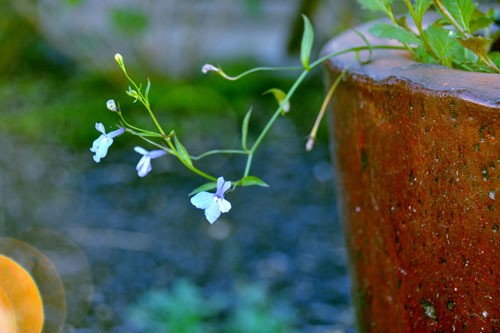 I do have this Lobelia erinus 'Fountain Blue' in a pot, where it is doing OK. I think it needs something more, maybe more fertility, because it doesn't quite have the oomph I'd like it to have. Or maybe I'm just missing its best season. It certainly is looking better since the overgrowth of California poppies that seeded themselves into its pot were removed. And that pot is due to have its soil refreshed sometime soon, anyway. And this. 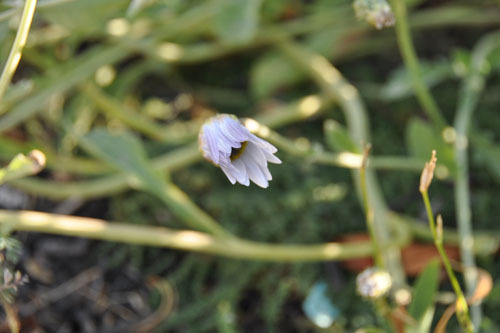 This is Arctotis grandis, which never ever opens up. I mean, it opens a little, maybe a quarter inch wider than this, but this is how it looks most of the time, never large and daisy-like like in the catalog photograph. I don't know that it's so much cooler here than a few miles north in Richmond, so maybe it's something else. I think I'm going to move it to a sunny bed in the back and see if that fixes anything, because it's just a little depressing right now. I took some time this afternoon and moved a couple of salvias from the front to beds in the back. I think I really am going to start enforcing a lower plant level in the front, rather than letting there be some very large salvias choking up the beds. What kind of passion flower is that? I'm currently growing whatever they sold me at the garden sale and it is growing like gangbusters (unusual for the complete lack of sun present in most of our yard) and fruiting like crazy. However the fruit remain green, even when they drop, and are not particularly flavorful. I've been thinking of switching to a more flavorful variety, if one will grown in Washington. Eradicating the current one may prove more problematic, however. I had no idea they were even hardy in Washington, and had just been planting them as an annual, until this one has survived and is now trying to take over the neighbor's yard, as well. Our passionfruit is Frederick. I have no idea if it will grow in Washington, and have heard other people say theirs did not fruit at all, but it does very well for us. 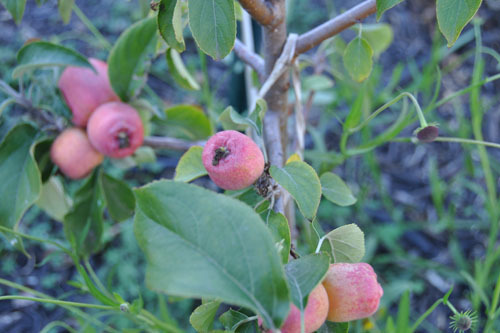 Our neighbors planted one based on a few samples of our fruit, and theirs also is fruiting like mad this year. And yes, they do kind of have imperialistic tendencies. We prune ours back three times a year. Your Whitney Crab takes me back to the one in my parents back yard in Wisconsin. Mom used them in her "chile Sauce" recipe. It used apples, tomatos and onions, and was great on a cheeseburger or meatloaf. If you are interested I could send the recipe. Even local people who might know (since they're big in Asian cultures) are often flummoxed, so I figured to err on the side of more informative.